Faith Connections on Mental Illness (FCMI) is an inter-faith coalition whose mission is to work with all local faith communities to advocate for and to support and educate individuals and families who are living with mental illness. 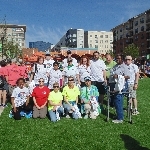 In the same spirit, our Walk Team is open to all. To support a specific individual on our team, just click on their name. We invite individuals, congregations, and organizations to walk/donate with us, joining as an individual or as a representative of your own faith community or entity. Congregations that have their own team are invited to affiliate with our corporate team to broadcast the statement that FAITH COMMUNITIES CARE ABOUT MENTAL HEALTH. All contributions – no matter how small – will be gratefully accepted. It is easy and safe to donate online, or you can give a check to any team member (made out to NAMI NC).